InM is planning to organise 6 regional dialogues in 6 divisions. The goal of these dialogues is to strengthen the collaboration with MFIs at the regional level vis-à-vis steps for implementation. InM is looking forward to building and strengthening a strong network of relationships among MFIs. On November 27, 2008, InM initiated its first Regional Dialogue (Rajshahi Division) at TMSS Bogra. The representative of 109 MFI’s attended the dialogue. The Executive Director of InM, Professor M. A. Baqui Khalily chaired the dialogue. Other discussants of InM were Dr. Muhammad Abdul Latif, Director (Research & KnM), Dr. Md. Mosleh Uddin Sadeque, Director (Training & Admin) and Mr. Md. Abdul Hye Mridha, Deputy Director (Training). Professor M.A. Baqui Khalily gave a welcome address to the representative of the MFI’s and introduced InM. Then Dr. Latif gave a short introduction about the InM and discussed the research work of InM. This was followed by Dr. Sadeque’s presentation on the training activities and the knowledge management of InM. Mr. Md. Abdul Hye Mridha also gave a short introduction on the importance of regional dialogue and expected outcomes. 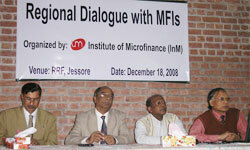 The regional dialogue titled “Regional Dialogue with MFIs” of Khulna Division was held on December 18, 2008 in the Rural Reconstruction Foundation (RRF) Training Centre in Jessore organized by the Institute of Microfinance (InM). This was the second of six divisional summits to be organized by InM to directly interact with the MFIs and understand the needs, problems and challenges being experienced at the grassroots level. Top management members from around 120 microfinance institutions were present at that occasion.